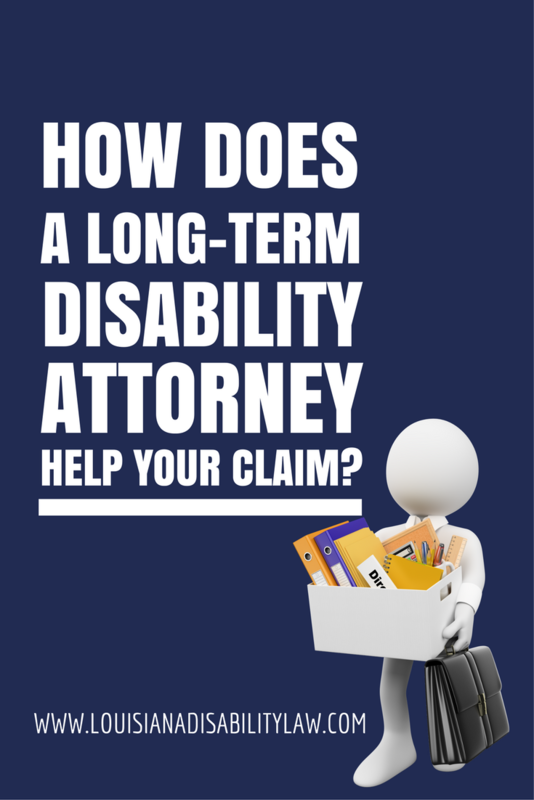 How does a long-term disability attorney help in my claim? I have spoken to many people who I simply could not help because all they did was what the disability insurance company told them to do all the way up to the time they received their final administrative denial letter. Basically, all they have to support their claim is the minimum information the insurance company wanted. A good long-term disability benefits attorney will help you “stuff the administrative record” with documents and evidence helpful to your claim. Much of it the insurance company will hate but has no choice but to accept into the record. They hate this evidence because it makes their job much more difficult. Filing a successful long-term disability claim appeal includes more than just filling out forms. You must know how to use the forms and how to supplement the administrative record beyond what the insurance company asks you to provide. To launch the best possible claim or appeal, a good disability insurance attorney will position your case for success with additional medical, vocational and financial evidence. This evidence is key to proving that you are disabled! And proving that the long-term disability insurance company made an arbitrary and capricious decision. What does a Long-Term Disability Lawyer do? A long-term disability attorney can help you find and acquire supporting medical and vocational records, job description evidence, plus written statements from family, co-workers and friends, and much more to support your claim. Arrange for an IME (independent medical exam) or FCE (functional capacity exam) or other medical testing (CTs, MRIs, blood work) that can help confirm you are disabled and fulfill demands for “objective medical finding” stated in the insurance policy. Work closely with your physicians, medical and vocational experts to help ease any difficulties in completing their statements in the best possible light, and protect them from harassment by the insurance company. One reason so many long-term disability appeals are denied is because the information requested by the insurance company is vague and (in my opinion) designed to help them deny your claim. The forms and information presented to claimants by the insurance company generally make no mention of submitting specific additional evidence. A good, experienced long-term disability attorney can help you fight back from the beginning and stuff the administrative record with good evidence necessary to win your claim. If you're preparing to file for long-term disability, we've created a checklist of "8 Specific Actions to Take Before Filing Your Long-Term Disability Claim." All we need is your name and email address, and we'll send you the checklist right away. Don't make a costly mistake before you've even applied! 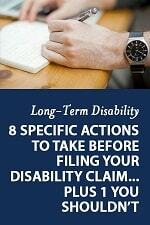 Just click here to receive your copy of "8 Specific Actions to Take Before Filing Your Long-Term Disability Claim." Will new ERISA Disability regulations affect your disability claim or appeal? As of right now, beginning January 1, 2018, the regulations that control ERISA disability claims and appeals will change. I feel this is great news because these new regulations will provide much-needed protections to many short and long term disability claimants. These important changes to ERISA law are the result of the Department of Labor’s review of ERISA legal cases since 2000. With these new rules, DOL acknowledged that ERISA rules are inadequate from a claimant’s standpoint. Existing ERISA law and regulations make it easy for insurers to deny valid disability claims without penalties, and the legal remedies and due process for claimants are very limited. This has resulted in many disability insurance companies handling claims in unfair and in some cases deceptive manners. The new ERISA disability regulations will help level the playing field for claimants. The new rules will apply to both short term and long term disability benefits plans provided through your employer. Certainly, the new ERISA disability regulations come as bad news for disability insurers who do not play fair. These changes will affect their administrative costs, increase burdens of handling claims, as well as increase litigation risk and add new legal complexities that work against them rather than for them. Disability Insurance claims and appeals must be adjudicated in a manner designed to ensure independence and impartiality of the persons involved in making the benefit determination. This rule means there must be no conflict of interest, no unprincipled benefit denials or other breaches of fiduciary duty. This could result in significant changes to disability insurance offices and could provide a fertile area for litigation discovery to see if disability insurers are truly administering claims in an impartial manner. For example, if companies promote those who deny claims over those who pay claims, the impartiality of the persons involved could be called into question. Disability Insurance denial notices must contain a complete discussion of why the plan denied the claim and the standards applied in reaching the decision, including the basis for disagreeing with the views of health care professionals, vocational professionals, or with disability benefit determinations by the Social Security Administration (SSA). This new regulation requires the ERISA disability insurer to tell you clearly in your denial letter why your claim was denied. If the disability insurer disagrees with SSA, this regulation seems to require them to say why. If they disability insurer disputes your own doctor, this regulation seems to require them to set forth exactly why. This rule seems to require the ERISA disability insurance company to list the disagreements out and explain in detail the basis for each of their findings. Claimants must be given timely notice of their right to access their entire claim file and other relevant documents and be guaranteed the right to present evidence and testimony in support of their claim during the review process. Did you know that you currently have right to receive your entire claim file? Many who file claims do not even know to ask for their claim file. While the insurance company is required to provide your claim file to you, they are not required to explicitly tell you. Under this new rule you must be notified by the insurer of your rights to access your claim file and all other insurance company documents necessary for you to properly file and develop your claim. 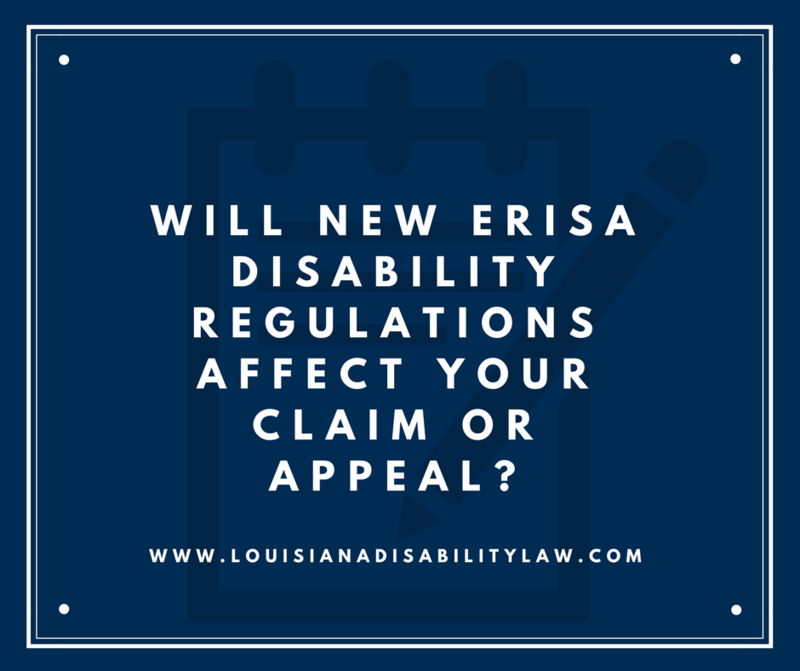 With the new ERISA disability regulations, you will have the right to review and respond to new information before the Plan makes a decision on appeal. If your appeal is denied, and the denial is based on new or additional evidence, the insurer must give you fair notice and a fair chance to respond. Currently, it is common for the disability insurance company to receive all of your evidence and arguments disputing their decision, and then they take that evidence and have another review that essentially refutes your evidence. You are not given another chance to dispute or refute what they have and then your claim is denied. This rule seems to provide you a full and fair review by providing a right to review and respond to new evidence or rationale developed by the insurer during the administrative review prior to the appeal decision. This may be a very helpful rule. Plans cannot prohibit a claimant from seeking court review of a claim denial based on a failure to exhaust administrative remedies under the plan if the plan failed to comply with the claims procedure requirements unless the violation was the result of a minor error. This rule takes away the insurer’s argument that you did not get a final decision from them before going to court. This is important because sometimes the insurance company’s strategy to deny a claim is to cause delays by withholding documents or information, or they may use other frustrating maneuvers like simply not responding to your appeal or claim. The new ERISA disability regulations prevent you from being barred from suing the insurance company if you fail to complete the internal appeals process when (1) the insurance company behaves wrongly or (2) procedural errors occur. If that happens, the court reviews the disputed decision without regard for the insurer’s decision. Certain rescissions of coverage are to be treated as adverse benefit determinations triggering the plan’s appeals procedures. This rule amends the definition of an “adverse benefit determination” to now include a rescission (withdrawal) of disability benefit coverage that has a retroactive effect. So, a retroactive rescission of coverage is considered to be a denial of benefits that sets off the Plan’s appeal process. Disability denial letters must be written in a manner and language that is understandable to the claimant, or otherwise include information of the availability of language services. What is a 'disabling injury case'? My office is now accepting disabling injury cases. But, you may wonder, "What is a disabling injury case?" An injury case is any case where an injury occurs due to an automobile crash, 18-wheeler crash, slip-and-fall, workplace injury or other torts. A disabling injury case is any injury case that requires hospitalization and an extended period of treatment or time off from work. For example, if you are involved in a crash with another vehicle on Hwy 90 in St. Charles Parish and as a result, you have significant back pain, you may have a disabling injury. If you are hit from behind on River Road and tear your rotator cuff, requiring surgery and physical therapy, you may have a disabling injury. Let’s say you work on the river and are involved in an incident that causes head trauma – you may have a disabling injury. If you or someone you love is in an accident and suffer a disabling personal injury that requires hospitalization and you to miss work, give us a call at Louisiana Disability Law at 985-240-9773. We have the experience to guide you through this difficult process and advise you on both the injury aspects of your claim and the disability aspects of your claim. How do I get to the Social Security office in Metairie, LA for my hearing? The Metairie Social Security hearing office is located at 1 Galleria Boulevard in Metairie, Louisiana. To get to the office, take Causeway Boulevard to Galleria Drive which is located just South of Interstate 10 between the Holiday Inn and Circle K.
Once you turn onto Galleria Drive, proceed down to the end. It will be 2 stop signs. Take a left onto Galleria Boulevard and proceed to the building. Pass up the Contract Parking Garage. If you need to be dropped off, you can be dropped off in the pullout in front of the building entrance. Park in the Visitor Parking Garage. Take a ticket. Handicap parking is on the left by the elevators. Go through the double glass doors to the elevators. Take the elevators to floor 7L. Exit the elevator and follow the brown walkway across the lobby to the building elevators. Take a building elevator to floor 20. Exit the elevator and you have arrived at the Social Security hearing office. Proceed to security for your screening. Have your picture ID and hearing notice with you. Remember that you cannot bring weapons such as guns, pocket knives, fingernail files or chemicals such as pepper spray or mace into the hearing office. If you have more questions about your upcoming hearing and what to expect, check out our blog post What to Expect at an SSDI Hearing. If you need legal help or have specific questions about your case, give us a call at 985-240-9773 or fill out the contact form to the left. Subrogation is the substitution of one person or group for another with respect to a debt or insurance claim accompanied by the transfer of any associated rights and duties. Subrogation typically arises in property insurance claims and health insurance claims. You are involved in an automobile crash that damages your brand new truck. The damage costs $25,000 to repair. You make a claim on your insurance to get your truck repaired quickly. Your insurance carrier is now subrogated to your right to sue the other party and/or their insurance carrier for the $25,000 that it paid to you. As a result of the same automobile crash, you are injured. When you go to the doctor, you present your health insurance card to receive treatment for your injuries. The total cost for medical treatment in your case is more than $150,000. Because the crash was caused by someone else, your health insurance carrier is subrogated to your rights against the offending driver for the amount of medical expenses it paid (more than $150,000). A tort is a wrongful act or an infringement of a right (other than under contract) leading to a civil legal liability. Torts can be negligent or intentional. One example of a tort is a car crash. The other drive may not have intended to hit you but due to either inattention or failure to obey highway laws or some other reason, they may have crashed into you infringing your right to the roadway. This is a negligent tort. Another example is if someone punches you - a battery. This is an intentional tort. Your Social Security Disability (SSDI) Claim Was DENIED!!! What now? Have you applied for Social Security Disability but your claim has been DENIED? If so, you’re in the right place. You are frustrated because you have submitted your medical records and answered all the questions SSA asked – but you have still been DENIED. The letter the SSA sent you to tell you that your SSDI claim was denied can provide you some insight. But do you know what the letter means when it says – We have determined that you can perform your past work? What about when the letter says – We have determined that you are not disabled from performing work generally available in the region. Do you know what you need to do to give yourself the best shot of succeeding on your appeal? Do you know what specific medical records can help establish that your disability meets a listing, and thus qualify you for social security disability? Do you how a medical source statement can be used to dramatically increase your chances of success on appeal? An SSDI attorney familiar with the specific rules and laws of the social security system can be the difference between you getting disability benefits and not. I am social security disability attorney Loyd J. Bourgeois, Jr. and I have helped people just like you get the Social Security Disability Benefits they need. I am based in the New Orleans area, with an office in Luling but can assist social security disability claimants in Metairie, Kenner, New Orleans, the Westbank, the Northshore, and throughout Louisiana get the social security disability benefits they need. If you are anxious to get started, call me at 985-240-9773 or fill out the contact form on this page for a free case evaluation. Just click here to fill out a form to receive the report. This special report will detail common mistakes made by social security disability claimants and what can be done to avoid them. Like Deadly Mistake No. 4 – failing to appeal your denial within 60 days. Learn more about this mistake and others. Plus, I’ll also include two bonus reports – Understanding The Medical-Vocational Grids (SSA’s Framework for Decision Making) and What To Expect At Your Social Security Disability Hearing. Just fill out this form to receive these three reports. You can also explore my blog, view Frequently Asked Questions, learn more about me, or check out my library or video tips. How long do SSDI benefits last? You will receive Social Security Disability Benefits for as long as you remain disabled under the Social Security laws. However, if you remain disabled at the normal Social Security Retirement Age, you will be converted over to Retirement Benefits instead of SSDI. What is an “onset” date? Your onset date is defined as the first day you are unable to work because of your disability. The onset date may or may not be the same as the date you were diagnosed. Applicants typically use the date they last worked as the date of onset. However, depending on the circumstances and the medical support the onset date could be after the date last worked. If I am approved for SSDI benefits, do I get other benefits? An SSDI beneficiary is automatically eligible for Medicare 24 months after the onset date or date they were found to be disabled. Medicare coverage starts in the 25th month of your SSDI entitlement. SSA will automatically send you information approximately 3 months before you are eligible for Medicare. Social Security disability recipients may be eligible for Food Stamps but must file a separate Food Stamp Program application. Requirements for eligibility vary. A Social Security Disability (SSDI) recipient may also qualify for SSI, depending on the amount of your monthly SSDI benefit and your other assets.